After submitting questions to the government, a Postmedia journalist received a phone call from Irving's president, followed by an email threatening to sue. Ninety minutes after Postmedia reporter David Pugliese submitted questions to two government departments about a possible issue on a navy ship, he received a phone call from the president of Irving Shipbuilding. 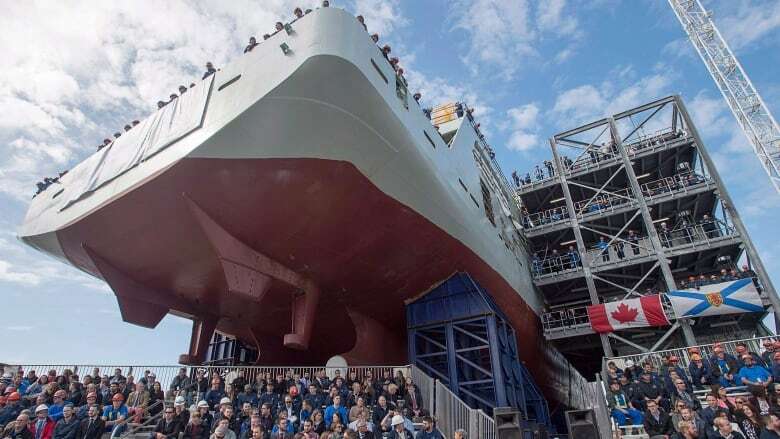 Pugliese was following up on a tip about potential problems with the welding on the new Arctic patrol ships that Irving is building for the Royal Canadian Navy. He submitted his questions to the Department of National Defense and Public Services and Procurement Canada. But instead of receiving a response from the federal government, he received a phone call from Irving Shipbuilding president Kevin McCoy, followed by an email from the company threatening to sue. The defence department has confirmed it contacted Irving and informed them of Pugliese's identity, and says it is investigating whether this violates the Privacy Act. "Regardless of that outcome," the department said in an emailed statement, "this is a matter we are taking extremely seriously and we have already issued interim direction to anonymize media requests pending further information." Irving Shipbuilding did not respond to a request for comment. Pugliese, who wrote about the ordeal for the National Post, spoke with As it Happens guest host Helen Mann. Here is part of their conversation. You have had a few days to absorb what happened — what is top of your mind about all of this today? Well, I guess the question that I've got — and it still hasn't been answered — is what's the level of co-ordination between this company, Irving, and the federal government? And one of the questions I've asked Procurement Canada is whether they're part of this lawsuit, or threat of lawsuit. What were you asking about when you sent your questions to both DND and Public Services and Procurement Canada? I was given some information that there were problems with welds on the Arctic offshore patrol ships. So those are being built at Irving Shipyards. The project's worth $3.5 billion. At 11:16 ET on March 6 I asked DND and ... Procurement Canada, as it's called, to comment. At 12:48 I get an email from Shawn Lewis of Irving Shipbuilding saying my inquiry has been brought to his attention and can we talk. At 1:23 we do talk, with Kevin McCoy, president of Irving Shipbuilding. And essentially 67 seconds into the conversation, he says I'm going to get, you know, a letter from their lawyer, which they followed up about an hour later. I said to Mr. McCoy, "How did you get my name? And how did you get my questions?" And he said that they were informed by their "client," which is the federal government. So I started thinking, what's going on here? I've covered the military for DND for 30 years, and I have never seen anything like this before. What is wrong about the information that was shared about you with Irving? First of all, I asked the federal government for comment. Irving isn't part of the federal government. It's a completely private corporation, an outside entity. And it raises questions about the level of co-ordination between this company and the federal government. You keep saying your questions are now about the co-ordination of information between the government and Irving. What do you mean by that? This is the third time it's happened where my information has been shared — the second time with Irving. In October 2016, a similar thing happened. I complained to Procurement Canada about that as well. Last year a similar thing happened with DND with another defence company — I complained about that as well. I did receive a response that time from DND saying that this would never happen again. Is this something that's unique to you and to Postmedia as far as you know? I would suggest, maybe, that departments have an unhealthy interest in me. I've been on the defence beat for 30 years now and so I know some of the inside stuff to ask and some of the questions, so they they watch me closely. So now there is an investigation into a possible breach of the Privacy Act. You've been told again that journalists won't be named going forward. What else are you looking for at this point? On a personal level, I'm going to file some access to information requests. I'd like to find out the extent of the information about me that was passed along. All I have is what the department is telling me. I'd like to see how they did this inside and what their thinking was because, quite frankly, I don't trust a lot of the answers that I'm getting since this whole thing became public. What is the company saying? The only time the company did respond, besides the brief interview with Mr. McCoy, was with their legal letter, which said that if I printed a story about issues with the welds forcing the ships out of water and such, that they would sue me personally and every single publication that carried that story. Now DND has confirmed that there were issues with the welds, but they say that they're minor. And if I had gotten that response earlier, I wouldn't have, well, there was no story. But that's what journalists do. We ask questions. Written by Alison Broverman. Interview produced by Richard Raycraft. Q&A has been edited for length and clarity.